Red White and Win Slots is a 3 reels 1 payline video game released by Vegas Technology. In case you adore the USA and can call yourself a patriot of this country this slot can be a finding for you… as well as for those who want to win impressive progressive jackpot. Created in the best traditions of classic slots, this game provides you with the opportunity to win the top jackpot of 1,500 coins. And of course, let’s not forget about the above mentioned progressive max jackpot that can be won in case you get the necessary combination of icons on the payline. This game is also available in no download format that allows you to play without installing casino software on your computer. Such icons as USA Flag, Bald Eagle, Washington, Seven, Single BAR, Double BAR, Triple BAR, Dollars, Statue of Liberty remind you about so well-known symbols of liberty and independence. Even getting one Bald Eagle on the reels you win some nice prize. The other thing is when you manage to get 3 USA Flags. This time you can win Max Progressive Jackpot. The highest jackpot is 1,500 coins or $3,750 for 3 Statues of Liberty if you bet 3 coins per line. The second jackpot is 1,000 coins or $2,500 for 3 Statues of Liberty if you bet 2 coins per line. The third highest jackpot is 750 coins or $1,875 for 3 Bald Eagles if you bet 3 coins per line. To win progressive jackpot is not as simple as it may seem at first glance. First of all, you should play with maximum 3 coins to win the whole progressive jackpot. Just bet 3 coins per spin and try to get 3 USA Flags on the payline to win the progressive jackpot. 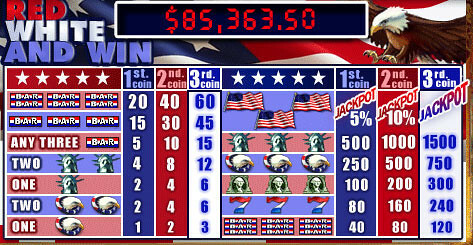 Note that if you play with 2 coins and get 3 USA Flags on the payline you will win 10% of progressive jackpot. If you play with 1 coin only and hit 3 USA Flags – 5%. 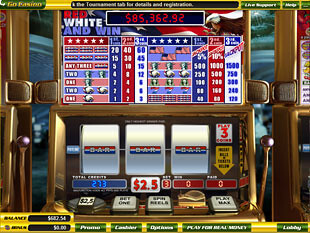 Red White and Win slot machine is a classic game for all who like the USA and its main symbols. The best thing about this game is that it allows you to win the progressive jackpot and have a good time visiting the country of your dreams.